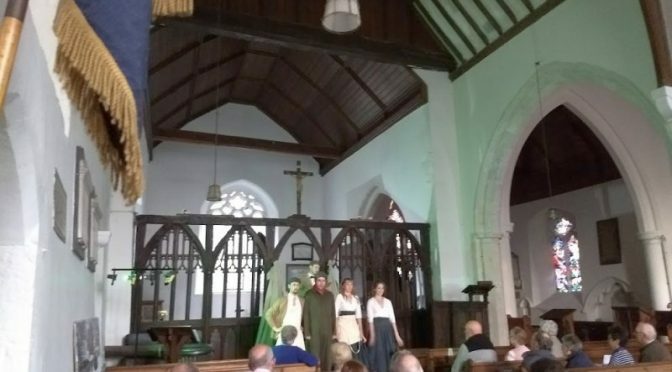 The “This is my Theatre” (www.thisismytheatre.com) performing arts company made a very welcome return to St Mary’s Church, Lower Higham on Friday May 25 at 7.30pm. The audience were enthralled with the adaptation of William Shakespeare’s classic fantasy of mistaken identities and mischievous fairies. The ancient church was a perfect backdrop and had been decorated to resemble a romantic woodland scene. All the parts were played by just four talented actors, who combined their singing, playing of musical instruments and even fighting skills to execute a really enjoyable performance. The travelling Theatre troupe are touring the South East over the summer months, do try and get along to see one of their plays, you will not be disappointed. The event was arranged by The Friends of St Mary’s in partnership with the Churches Conservation Trust and was one of several events planned for the summer and autumn.